DUBAI: More than 3,000 Emiratis have applied for the four available training courses to become the UAE’s first astronauts. Yusuf Al-Shaibani, director general of the Mohammed bin Rashid Space Center, revealed the latest numbers in an update on the UAE’s space program, which was set in train in 2014 with a view to sending a spaceship to Mars by 2021 to coincide with the country’s 50th anniversary. 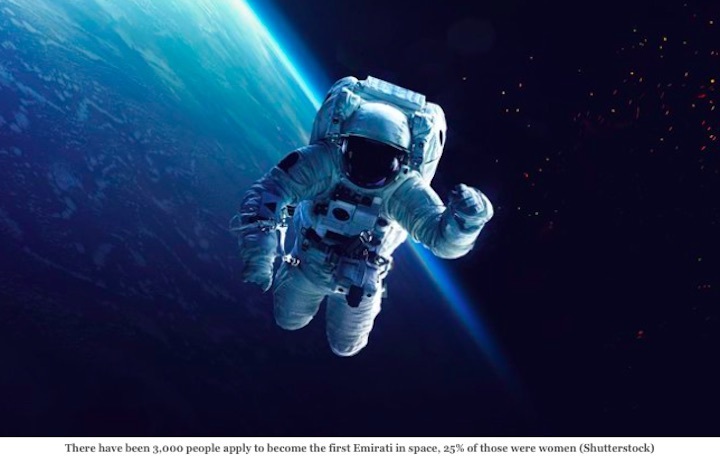 Al-Shaibani said such a level of applications — from a country with a comparatively small population — compared very favorably with the numbers applying to the American NASA program, which attracted 18,000 applicants. A quarter of the applicants were women, the youngest was 17 and the oldest was 67. “We wish him luck,” Al-Shaibani said. Just over a fifth of the applicants were ether commercial or military pilots, and many had university qualifications in science, technology, engineering or mathematics, the so-called “Stem” disciplines. “This is not space tourism, but a real initiative to encourage Emiratis to study science and technology,” Al-Shaibani said. The applicants will go through a stringent period of assessment and evaluation before the final four are selected to go into full-time training for up to four years, after which they will be qualified to travel to an international space station orbiting Earth. The search for the first Emirati astronaut is part of the country’s ambitious space program, which also aims to send a mission to Mars, as well as a longer term plan to put human beings on the Red Planet in just under 100 years’ time in domed “colonies,” Al-Shaibani explained. Mariam Al-Shamsi, director of space science at the Space Center, said the facilities it already had in Dubai enabled it to study what it was like to live on Mars, and to undertake research on the prospects for food, water and energy on the planet. “The projects are on line and on time. We have finished the engineering design for the Mars satellite, and now we are in the flight development stage,” she said. The Mars satellite will be a scientific first, because it will enable scientists to take readings and samples of the Martian atmosphere at regular intervals on each day of the year. The idea is to “build, not buy” the technology for the space initiative, but it depended on international collaboration with other governments and specialist areas of knowledge, Al-Shaibani said. The UAE partnered with South Korea in the early stages of the program that sent two satellites into space from Dubai. A third, KhalifaSat, is planned to go into orbit this year.